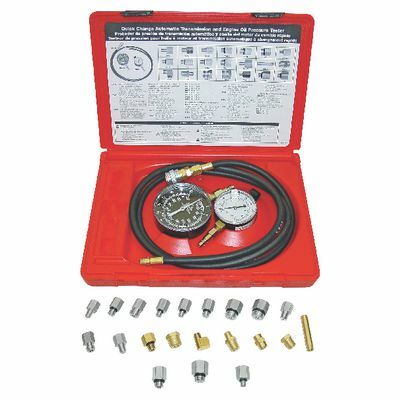 AUTOMATIC TRANSMISSION OIL PRESSURE TESTER is rated 1.0 out of 5 by 1. Rated 1 out of 5 by tech324 from Low quality, High price Purchased this set from my Matco rep 2 years ago. Only used a few times. Pulled it out yesterday to run some tests on a trans, found both guages reading 10 psi sitting in the box. Useless to me if they aren't accurate. 10 psi without being hooked up, then what is my actual reading at 60 psi? Cannot be zeroed. Junk.